Start Your Journey NOW! Enroll in our FREE Year To Success Online Course. 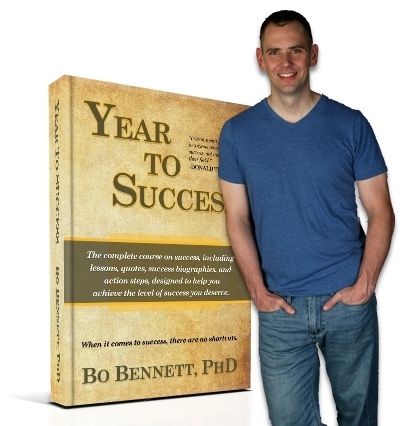 Bo Bennett knows about success. By the age of 29 he had developed, built up and sold an innovative technology company during the peak of the tech boom and sold it for ,000,000 -- and got to keep most of it! He now gives back information and inspiration that can lead others to live a successful life in his debut book, Year To Success. Bo represents a new generation of self-made millionaires, using creativity and initiative to exploit the latest developments in the fast-growing technology and service sectors. Many of the ideas in his book came from his independent pursuit of success and were later validated by the end results and echoed by other leaders and entrepreneurs. "There are no secret formulas or insider rules to be acquired," says Bo. "In fact, many of the principles are not new, but rather, they are time-tested, proven and self-evident. This is perhaps the most comprehensive book, filled with simply stated values of how to become successful." In fact, where most people trumpet quick paths to boundless wealth, Bo purposely slows it down and creates a year-long program and systematic approach that has roots in the teachings of the masters of success: Dale Carnegie, Napoleon Hill, Zig Ziglar, Denis Waitley, and Anthony Robbins. What do many people fail to do that could make the difference between living a life of proven success vs. one only of promise and what could be. In an increasingly global, digital, freelance society, do the success strategies change with the times -- or are they as important and relevant as ever before? What are the lessons learned from successful people like Oprah, Trump, Gates, Seinfeld and Schwarzenegger? Is our society too money-centric to be successful? Why you should believe you can be successful -- and what you'll need to do to become successful. He shares literally thousands of principles, including: view failure as being temporary; never, ever lie; face your weaknesses; be a mentor; take initiative; never be a one-upper; and shows us how to find opportunities. He also emphasizes the need for time mastery, self-discipline, having a strong vocabulary, mastering grammar basics, learning speed-reading; and implores us to take up martial arts -- "it gives you confidence, discipline, fitness, security and goals." Year To Success draws on the wisdom and inspiring words of model success stories, sharing the insight of dozens of political leaders, CEOs, entrepreneurs, inventors, and modern-day celebrities. Members of this diverse group include: Thomas Edison, Mary Kay Ash, Ben Franklin, J.K. Rowling, Albert Einstein, Michael Bloomberg, Helen Keller and Jackie Chan. Many references to pop culture and movies are made, providing easily identifiable examples, drawing on movies such as The Godfather, Crocodile Dundee, What About Bob, The Shining, and Naked Gun. "The pursuit of quick riches only leads to cons, scams and shady sales jobs. Anyone promising instant fortune with little or no effort really means that they will become instantly rich off people who send them money." "Nobody can tell you exactly how to become successful. Lasting success must be achieved through passion, and only you know what you are passionate about." "Many people who sell 'how to get rich' ideas only became rich themselves by selling their own books, tapes and seminars on how to get rich! These are authors that usually hide their professional background from their readers." Year To Success also tells us how to: handle mistakes; recognize a dead end, make strong first impressions; sacrifice; make decisions; make the best of a bad situation. Readers are also encouraged to create a "dream collage," which is a collection of photos, magazine clips or other images that define our ideas of success and read like a photo album of the life we'd like to live. It serves as an inspiring visual reminder. 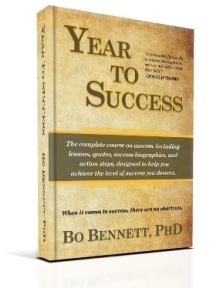 Year To Success also highlights Bo's foundation for success: education plus inspiration plus action equals success. Bo warns us that one of the biggest mistakes people make in the pursuit of success is "giving up on single ideas, beliefs, skills and concepts because they see little or no change from them. They change to a successful behavior, notice no change, and then revert back to old behavior. This is like taking a step up your ladder, not being able to see the top any better, then stepping back down. With this pattern, you can easily see why so many never reach success." Bo reminds us to be people of action: "Taking action is what this book is all about. It is doing the action steps that bring you closer to success." Or as Walt Disney said, "The way to get started is to quit talking and begin doing." Bo knows of no other way. Enroll in Bo's How to Present a Meaningful and Powerful Presentation: for the Scientist and Engineer Online Course. This is a crash course for scientists and engineers who want to improve their presentation skills. Business Consulting. Contact Bo any time by e-mail, Skype, or phone to discuss your business ideas or personal success goals.